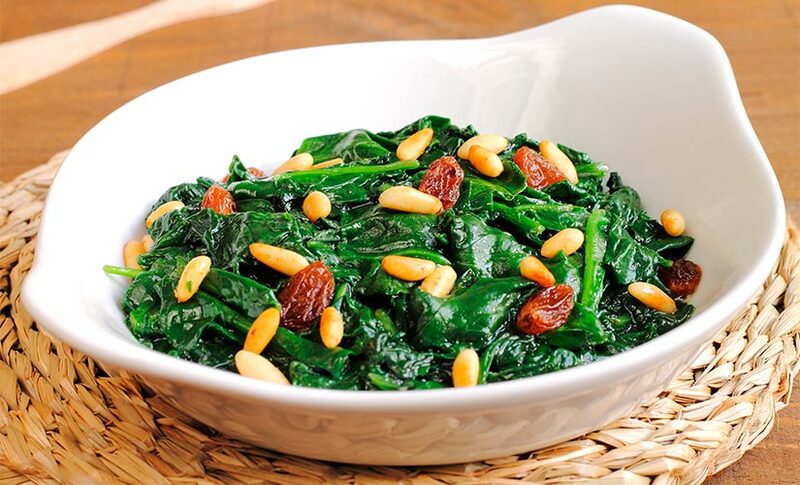 This Catalan-style spinach recipe is perfect as a main dish, as a tapa or even as a garnish. Besides, spinachs are highly-nutritive ingredient also high in water, fiber, and nutrients, and low in carbohydrates and fats. We have decided to garnish our recipe with a product with a certificate of origin, which will provide our dish with more flavor and quality: raisins from Málaga. This recipe will delight both children and adults and it does not take long to prepare. Are you ready? Clean and cut the spinachs (try to remove all the sand and dirtiness of the spinachs). Bring a pot of water with a bit of salt to a rolling boil: boil the spinachs for 5 minutes. Remove it from fire and then drain the spinach. Let the spinach cool and cut into pieces. Pour some olive oil into the frying pan, brown the garlic already chopped together with the ham chunks. Add the raisins to the pan and when they start swelling, then add the pine nuts and fry slightly. Before pine nuts brown, add the spinach for some minutes. Add some more ham chuncks and move it and cook it over a low heat. Finally, serve it and garnish it with a slice of fried bread. Would you like to add or take any ingredient awat? Let us know how you prepare this yummy recipe.